Russia's coach Fabio Capello (C), assistant head coach Alexandre Nizelik (L) and assistant coach Christian Panucci, stand for the national anthem before the start of their 2014 World Cup Group H football match against Algeria at the Baixada arena in Curitiba, Brazil. Fabio Capello will stay on as Russia coach until they host the 2018 World Cup if he is still wanted after his team failed to make it past the first round in Brazil. Playing at their first World Cup since 2002, Russia went home without a win after Algeria held them to a 1-1 draw on Thursday and advanced at their expense. "You will have to ask those who are in charge," the Italian told reporters when asked about his future. Capello, 68, signed a lucrative four-year contract in January that would take him through to 2018. Capello coached England at the 2010 World Cup and has only one win to show from seven matches at finals with the English and the Russians. He defended his record robustly. "As for England, we made the second round where we lost because of a goal that led to the introduction of technology," Capello said, referring to a shot from Frank Lampard that would have levelled the game with Germany 2-2. The goal was not given and Germany went on to win 4-1. 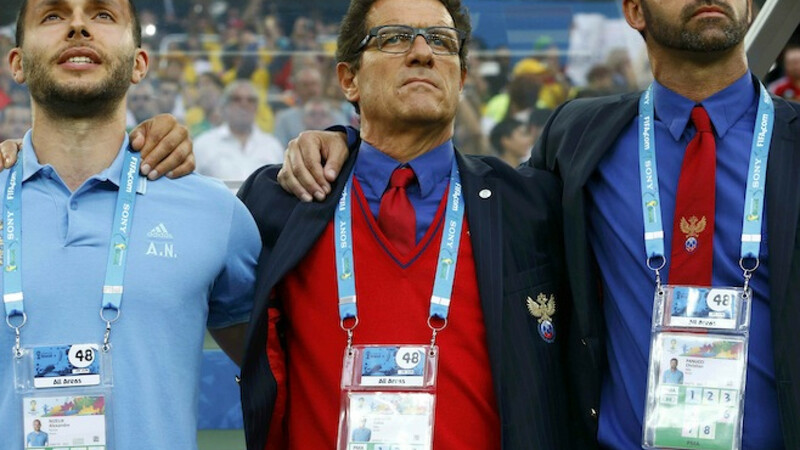 Capello pointed out that he had a good record in qualification for major tournaments with England and had steered Russia to their first World Cup for 12 years. "I think I've done a good job up until now," he added of his two years with Russia. His international record contrasts with a glittering career as a club coach, winning league titles in Italy and Spain. Capello complained that his team had lost to a goal scored from an Algerian free kick that was incorrectly awarded. He added that his goalkeeper Igor Akinfeev had been blinded by a laser beam from the crowd just before the goal. "If there is one thing that we can complain about at this World Cup, it's the refereeing. I have kept quiet but now it's over," he said, speaking in Italian. Capello grew irritated when it was suggested that he was seeking excuses. "Maybe you've got the wrong guy. I've never been one to look for excuses," he said.